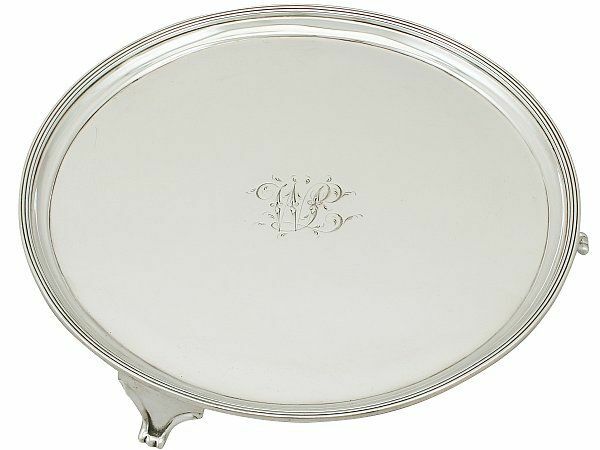 This fine antique George III sterling silver salver has a plain circular rounded form onto three bracket style feet. The surface of this silver salver is embellished with central contemporary bright cut engraved initials 'WL'. The rim is ornamented with an applied thread decorated border. This collectable salver was made by John Prince, Robert Cattle and George Cattle I of Prince & Cattles in the provincial city York, England. This antique Georgian silver salver is a very good gauge of silver, fine quality and in excellent presentation condition. Full hallmarks struck to the underside of the salver are very clear.